That's me. I feel loony. It's just too much to deal with! Remodeling, moving, BABY. And I have that constant reminder on the side of my blog saying how many days I have left. It's in the 20's people! AND that's only if Katie decides to cook full term. She really could come anytime! Am I being dramatic? Something positive is that my hall bathroom is painted and I LOVE the color. It's called Spaqua! Ignore the fact that it doesn't have a toilet or sinks. At least it's a pretty color! 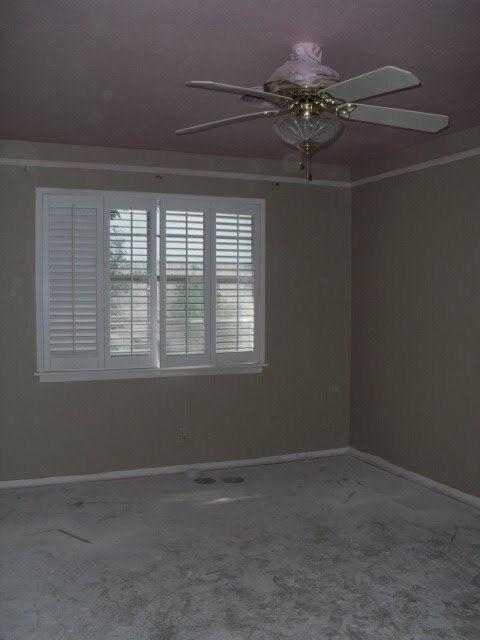 This room, on the other hand, makes me a little sick to my stomach. I agonized over what Khaki paint to get, because they can come out so different from the little sample card. I thought I was being really safe, because I went with a Waverly color called KHAKI. Well in 2 of my rooms it totally looks purpleish! ugh! This is the sitting room/ office. I am pretty sure I am going to repaint it today or tomorrow. 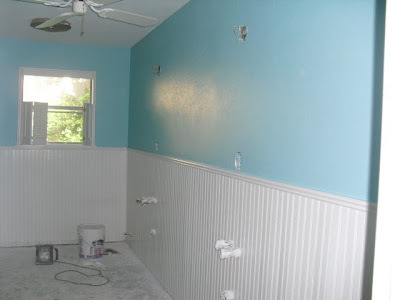 We can't afford to pay the painters to paint the same room twice! I really really really don't feel like painting though. I know it will be easier to get done now, before floors and furniture are put in though! 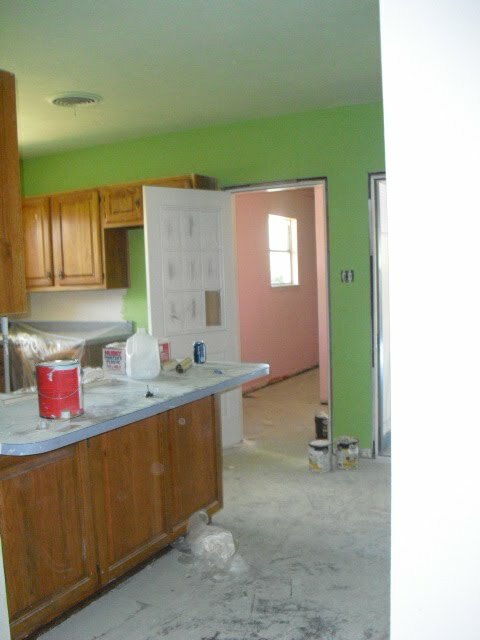 I did make them paint this laundry room twice. First it was red, but looked orange, because they didn't use the gray primer I bought. So now it's going to be PINK! It still needs another coat. 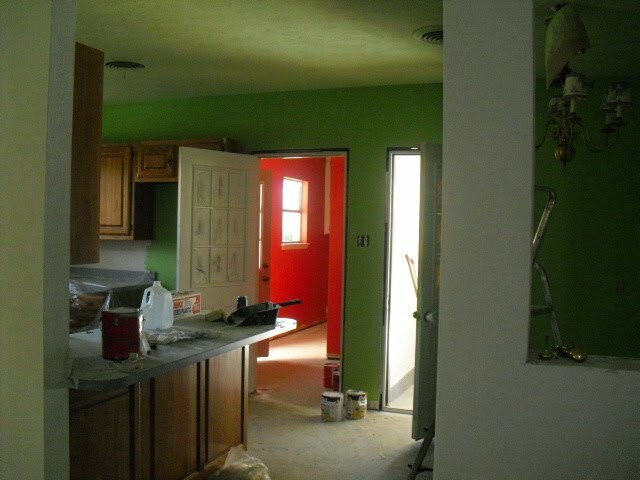 And those kitchen cabinets are black now. I still need to do some touch up today, but yesterday my sister and Marcus's sister helped me paint them. Then tomorrow the tile guy is coming and we are getting black and white checker board tile in the kitchen, laundry, and the pretty blue bathroom! This is going to be Katie's room. She is getting a new light fixture as we speak. Or as we type and read. 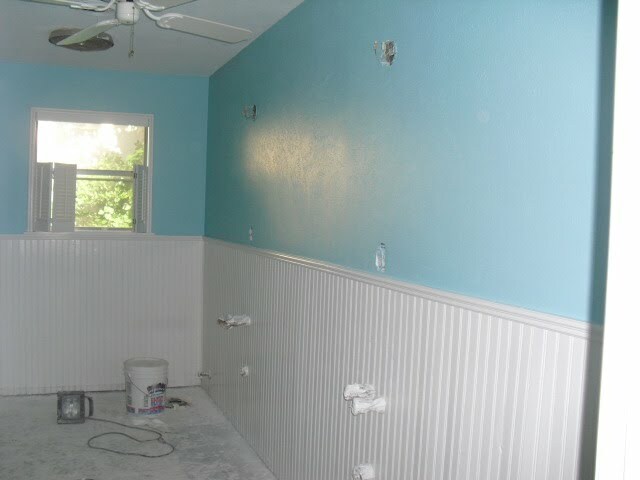 And the painters are still not nearly finished. The main guy's wife was supposed to have a baby this weekend. Well they have been trying to start contractions all week with that gel stuff and then induced her on Sunday and She is STILL holding on to that baby! So we are waiting...but I am pretty sure his wife is more anxious to get that baby out than I am for my painting to get done. I can't imagine renovating a whole house nine months pregnant! You are a "soldier" as my hubby likes to say ;) I moved when I was 3 months pregnant and thought that was bad! You will get it all done, not to worry! It's coming together great! Love the bathroom color. Who makes that color? You are totally cool doing all of this while so far along. I was on bedrest for 22 1/2 weeks with my first so I had plenty of excuses to not do a thing! My second came at 37 weeks on the nose, so you're right... Could be any time. Hoping for you guys, she stays put for another 3 weeks or so. You're making great progress! Girl, I admire your energy. I think I spent Month 9 on our couch complaining both times. You have such a unique style! I love it! I'm tellin' ya, "Bleached Wheat" at walmart is the best khaki in all the land. It's looking great! Tan colors are SO HARD to get right! Depends so much on how the light hits it!! 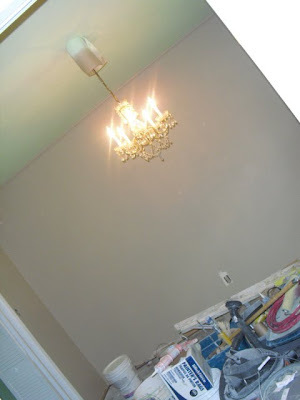 Our horror story: When we built our house, I picked out a light gold color for all of the main walls. My husband "surprised" me over Labor Day weekend, when it was over 100 degrees, and I had been gone all weekend and painted the ENTIRE upstairs. When I went up there, it looked PEACH! It was awful! We had to repaint it! I felt so bad!!!! We got it right, though, and I do love it. But, oh the drama. Are you sure that first picture with "Spaqua" is a bathroom? You know, someone may call Child Protective Services on you if you try to potty train Katie Belle in that bucket one day. And yes, 37 weeks preggers is a whole lotta weeks, especially in JUNE in TEXAS. Oddly, you could go into labor now, or in a month from now (but I wouldn't wish 41 weeks on anyone). I'd be in a pool all day everyday when I'm not sitting in front of a fan or A/C. Dina, don't worry about being dramatic.....who cares, I'm dramatic ALOT pregnant or not AND I'm even more dramatic toward the end of my pregnancies. You are also nesting, so it forces you to want it all done NOW and perfect before the new babe. I don't see the purple in the khaki, but I believe you......personally, I think there's been a lot of progress with the house considering your time frame you've had to work on it. It will all be ok, I promise. Hey girlie! This is my first time to comment on your blog but I just LOVE your blog and your style. It is just precious and soooo southern!!! I have a quick question for you though... what type of paint did you use to paint your appliances? And, can you give me a quick how to? I am also pregnant (3rd pregnancy-finally a girl- whoo hooo!) and I am nesting BAD I am wanting to do all kinds of projects! My email is jacobspac@yahoo.com thanks girl! p.s. can't wait to see katie's room!!! !